You expect lawyers to defend their clients. But shouldn’t a government lawyer always act in the public interest? Last Friday in Toronto, the appeal against the Renewable Energy Approval for the “Nation Rise” wind power project—an appeal launched and funded by the community—heard closing arguments from the citizens’ group appealing the approval, the multi-billion-dollar Portuguese wind power developer, and the Ministry of Environment, Conservation and Parks. The latter was represented by Ottawa-based lawyer Paul McCulloch. His job is to defend the Wynne government’s hasty approval of the 100-megawatt power project, south of Ottawa. Question: Should a government lawyer not be also responsible for defending the residents of North Stormont from the adverse effects caused by a wind power project? What happened though, was that Mr. McCulloch made astonishing comments in response to evidence brought forward on the risk to human health. Mr. McCulloch alleged that “no” wind power project has ever been tested and found out of compliance in Ontario. This is patently false. To name just one example, the Unifor turbine in Port Elgin has resulted in hundreds of noise reports, it was found out of compliance and is now under a power reduction order and noise abatement plan (though noise complaints have not stopped). 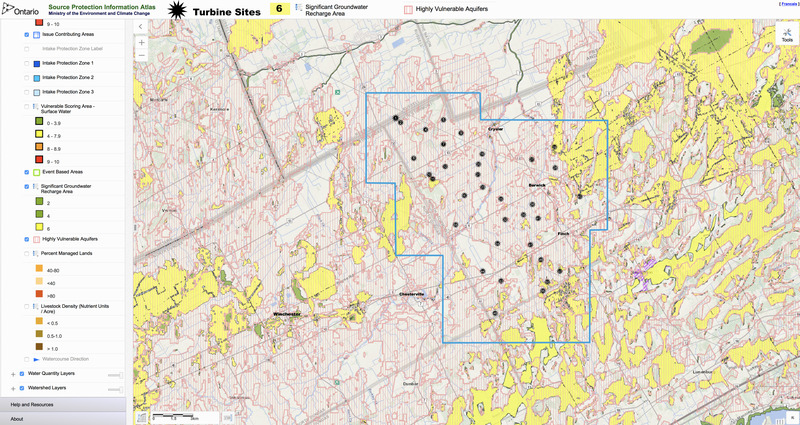 Similarly, there were many noise reports for the Melancthon wind power project between 2006 and 2009, that the environment ministry did inspections and testing and concluded “the sound discharged into the natural environment from the wind turbines would cause an adverse effect.” * The company was ordered to reduce noise levels, and remodel several of the turbines; when that was not entirely successful, the ministry further worked with the operator to employ a noise abatement plan and in 2011, implemented a “noise reduced operating plan” according to a ministry report obtained under Freedom of Information request by Wind Concerns Ontario. 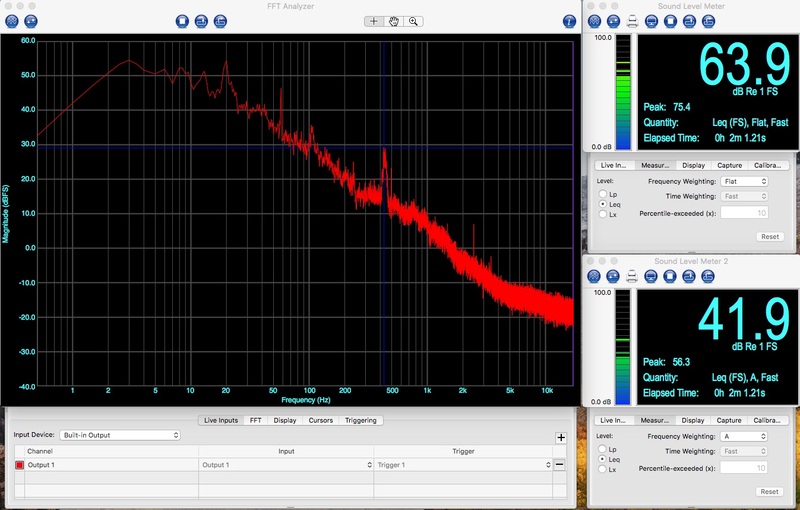 So, yes, turbines have been found out of compliance and abatement orders issued; the reality is, many others are caught up in a seemingly endless round of audible noise testing through a flawed protocol. Mr. McCulloch also dismissed government records of complaints from residents presented by Wind Concerns Ontario as evidence of problems and especially adverse effects from wind turbine emissions, saying no conclusions can be drawn from self-reported complaints. However, “assessment” of noise/adverse effects complaints has not been a requirement of the process, so there would not be such records of medical opinions. And the ministry doesn’t follow up on reports of adverse effects, or even refer them to the Ministry of Health. The MOECC (now MECP) also does not collect information on academic credentials of the people as part of the complaint tracking process. The reality is, trained healthcare and medical professionals are among those who have filed complaints about the impact of wind turbines on their health, and others have had their assessments confirmed by healthcare professionals. Government lawyer Mr. McCulloch, however, essentially stated that unless people registering complaints with the MECP provide medical proof, their reports are of no consequence. Does this mean that the thousands of provincial records of noise complaints are meaningless? That adverse health effects being reported to government are ignored? That is a terrible message for the people of rural Ontario. Mr. McCulloch’s comments may also have undermined a community health investigation being carried out at the request of Huron County citizens, funded by Ontario taxpayers. The investigation was initiated by public health officials in the Huron County Health Unit in response to clusters of health complaints related to wind turbines. It is being carried out under authority of the Ontario Health Promotion and Protection Act. But now, is all hope for this project dashed? At the hands of a government lawyer? Mr. McCulloch, a public servant, demeaned the investigation process and criticized the fact that it relied on information solicited from “volunteers.” By “volunteers” he meant Ontario citizens, the same citizens who have been dutifully filing complaints with the environment ministry since 2006, with little or no action. Contrary to Mr. McCulloch’s remarks on the methodology in the investigation, it is modeled on the Health Canada community study, and received ethics approval from a university. Various challenges in the community (non-disclosure clauses in wind turbine lease agreements, distrust of more “study,” and despair at the lack of government action) have led to a lower participation level than expected by the investigating health professionals. In recent weeks, the Medical Officer of Health and the staff epidemiologist have been in the media, renewing invitations for citizens to participate. Who will participate in that important ongoing community health project now? Speaking apparently on behalf of the government, lawyer McCulloch essentially said any results will mean nothing to the MECP. The lawyer also told the Tribunal that current Ontario setbacks and noise limits reflect the “consensus view” of the impact of wind turbines on health. That statement purposely ignores a report prepared by the Council of Canadian Academies for the federal government that demonstrated the basic measurement tool Ontario uses to assess wind turbine noise is inadequate, as well as the report issued by the Australian Senate Select Committee on Wind Turbine Noise, and recent announcements from the World Health Organization recommending a more stringent noise standard for wind turbines in Europe than is used in Ontario. Mr. McCulloch’s statements to the Environment Review Tribunal were misleading. The environment ministry should clarify his remarks immediately, in order for the Tribunal to be informed with the truth. Last week, MPP Jim McDonell (Stormont-Dundas-South Glengarry) rose in the Legislature to speak in favour of changes to the Green Energy Act, and brought forward the serious concerns for the environment, health and safety posed by the Nation Rise wind power project in North Stormont. Currently under appeal, evidence brought forward has shown the environment ministry staff were not even aware of significant risks to the water supply, for example, or to safety posed by the Leda or “quick” clay, and the former government did not require the power developer to provide proper assessments. Mr. Jim McDonell: I’m pleased to join my colleagues to speak on Bill 34, the Green Energy Repeal Act, 2018. We promised a government that puts the needs of everyday people first—another promise our government for the people is delivering on. That theme went through our campaign and got us to where we are today. The people of Ontario were tired of a government that not only didn’t listen to them, but they were gouged at every opportunity. The two opposition parties can point fingers all they want, but remember that when you point a finger, three of them point back at yourselves. They worked together to push through the Green Energy Act when experts around the province warned them of the dangers of not using the science to develop energy policies for Ontario. The summer before I was elected, Professional Engineers Ontario published a research paper on the problems with the Green Energy Act. They highlighted that a system such as ours, which relies on central power stations, cannot be converted easily to a distributed power format, and such a plan would generate unneeded surplus power that simply couldn’t be ignored or destroyed. Thus we see the problems with the Green Energy Act. Unneeded, unpredictable and comparatively expensive, supposedly green energy is dumped into the system when our much cheaper water and nuclear systems are fulfilling all the demand. Remember, you can’t destroy excess power. It must be used or other, less expensive, sources throttled back. In the water world, water was diverted around or spilled over dams to avoid generating power. That was cheap power that was already paid for but not being used. In the nuclear world, thanks to an innovation by Bruce Power, they developed a way of dumping substantial amounts of steam, enough to account for a measurable amount of excess power. But, remember, the steam had already been paid for. One might wonder why Bruce Power was the only nuclear power producer in the world to develop such a system, but it’s sad to say that it was self-inflicted. The Liberal and NDP governments had ignored all of the warnings, pushing the Green Energy Act on our utilities, who were forced to make the best of a bad situation. The Liberal government bragged that they would be the number one producer of green energy in the world, but at what cost? The only way to attract the amount of investment required to build facilities on the scale they wanted would require a guarantee of return on capital unattainable anywhere else in the world, and that’s exactly what they did. The 80 cents per kilowatt hour was more than double what Germany had agreed to, and they were in second place. To be fair to Germany, they quickly realized how their price was unsustainable in their program and cancelled theirs. A person just north of my riding was awarded one of these rich contracts. He decided to delay the construction for a period, as allowed in the contract, until the technology had brought down the cost of materials, as everyone predicted it would. He was attending a solar conference in the US, and one of the presenters asked, “What was the price that everyone was receiving?” When he said it was 80 cents per kilowatt hour, first it was laughter, then disbelief. No one believed him. The rate of return was outrageous. The wind turbine guarantees are the same: They’re strictly outrageous. What was the result? A huge construction of unneeded power generation and capacity—and the problems started. Auditor General’s report after Auditor General’s report hammered the Liberal government on the dangerous and ill-thought-out plan. First, they tried to justify it to close coal plants, but they were proven wrong, as efficiencies obtained by Bruce Power alone more than allowed for the power they needed to close these plants. Then they originated a plan where they had wind turbines simply shut down, not producing the power, but with sensors added to the turbines, they would be paid for the power whether they produced it or not—a completely ridiculous plan, but they sold it as a solution. All this time, especially during the minority Parliament, when our party would introduce motion after motion to stop the foolishness, the NDP helped the madness continue by voting for the Liberal minority government. It’s particularly satisfying today to finally debate a bill that will end the calamity. The Liberal government could no longer hide the facts, and the people of Ontario gave the Doug Ford PC government a massive majority and a mandate to clean up the mess. But, unfortunately, the Wynne Liberal government, with the support of the NDP, have saddled the people of Ontario with a huge bill that must be paid back through outrageously high energy bills for decades to come. I see people come through my constituency office, and they are in trouble. They can’t afford to pay the hydro bill and their taxes and have enough money left to put food on the table. I was talking to a local senior couple just a couple of months ago, and the lady said that they would have liked to go to the local fair that day, like they always used to do, but it was $10 and they just couldn’t afford it in their budget. That’s a common thing I hear across my riding. People cannot afford to do anything but simply cut back and try to put food on their table. As I said, the couple is like the vast majority of Ontarians, who don’t have a generous government pension plan. They have been experiencing years of expenses escalating at rates much higher than the money they were managing to put aside. When your pension increases by $10 or $20 a year, how do you cover hydro increases of hundreds of dollars a year, property taxes of hundreds of dollars a year and more? You can only save so much by doing your laundry at night and turning your thermostat down. The Liberal government just didn’t get it. The increased minimum wage doesn’t help people who can’t work either because there’s no work available or they just can no longer work. That is why our government for the people promised to work for the people. The Liberal carbon tax was nothing more than another tax for an out-of-control-spending government, and experts were clear that the plan would not allow Ontario to meet its targets. It only resulted in life being more unaffordable and the business environment being more uncompetitive. Under the Liberal government, energy rates tripled, hurting families and driving manufacturing jobs out of Ontario. Let’s be clear: The Green Energy Act helped Liberal insiders get rich while families across Ontario were forced to choose between heating their homes and putting food on their tables. The Green Energy Act made it much harder for businesses in Ontario to stay in business; thousands of jobs were lost across Ontario because manufacturing plants were too expensive to operate. Ontario lost more than 300,000 manufacturing jobs, not to China or India but to our neighbours south of us. The Liberal government’s mismanagement of our economy and massive spending to cling to power at all costs cost Ontarians their good-paying jobs. It’s time to put people first. With the repealing of the Green Energy Act, we’re also proposing amendments to several existing acts, including the Planning Act and Environmental Protection Act. The proposed legislation would give the government the authority to stop wasteful energy projects where the need for electricity has not been demonstrated. As the parliamentary assistant to the Minister of Municipal Affairs, I am comforted to see the amendments that would give municipalities back their voice when it comes to making future energy decisions. I share the belief that the people of Ontario should have the final say about what gets built in their communities. By restoring municipal authority for the placement of renewable energy facilities, we’re ensuring that future projects have the support and buy-in of local communities. Because municipalities have told us time and time again that they felt ignored when wasteful green energy projects were forced upon their communities. Madam Speaker, let me tell you about the plight of residents of North Stormont. They had been battling against a huge multinational corporation, and they were promised that if they were an unwilling host, they would not receive the project. The small rural township passed what they thought was needed, a resolution that would designate them as an unwilling host, and sent it off to the Liberal government. 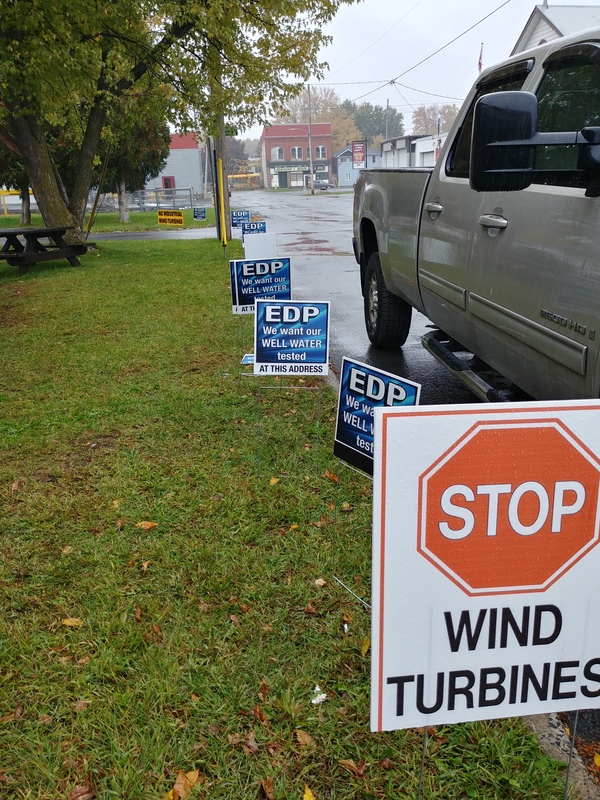 They turned down a huge amount of money from the project company, approximately $500,000 a year, because the residents did not want the problems and the issues associated with wind turbines. Madam Speaker, $500,000 is a huge amount and would go a long way to pay for roads and infrastructure in a small rural township of approximately 6,000 residents, the smallest population in SDG. Potential health issues, noise issues, groundwater issues were just not worth the money in their minds. ERT chair Maureen Cartier-Whitney hears evidence on groundwater. Geoscientist said it is possible there is no effective mitigation for the vibration produced by turbine construction and operation. 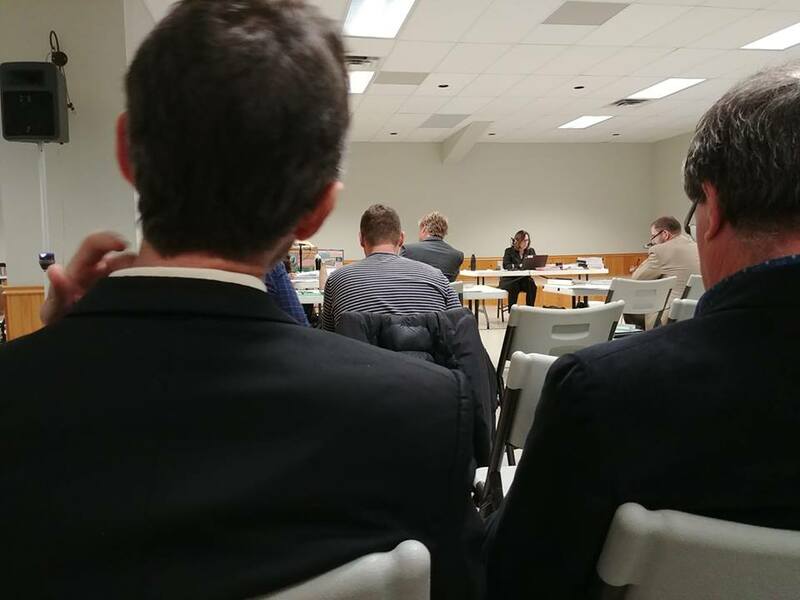 Finch, Ontario — The Nation Rise wind power project, which received Renewable Energy Approval in May, poses a significant risk to people and the environment due to vibration connected to the construction and operation of the wind turbines, a geoscientist told the Environmental Review Tribunal when the citizen-funded appeal resumed today. Angelique Magee said that the project area is located on the former Champlain Sea and the nature of the soils plus the presence of Leda or “quick” clay represents a “high potential” for landslides. She provided details of landslides that have occurred in Eastern Ontario and Western Quebec, including one that resulted in loss of life. She also recounted the story of the village of Lemieux which was evacuated due to risk of a landslide because of Leda clay and which subsequently did slide into the Nation River, causing a loss of land, killing fish and destroying fish habitat. Leda clay is prevalent throughout the region, Magee said. The soil is such that when it is disturbed by vibration, it can become liquid, thus causing the landslides. The risk is high, McGee said, and would pose a serious risk to human health and a serious and irreversible risk to the environment. A third risk factor is the presence of karst topography which is characterized by fissures and can lead to contamination of groundwater in certain situations, construction vibration included. The geoscientist was asked about the use of quarries in the proponents’ environmental assessment, which she said was not appropriate. The turbines would cause constant vibration, she said, which different from blasting occasionally. When asked if the conditions of the REA would prevent harm, Ms Magee said, no. The measures proposed would not necessarily prevent a landslide or contamination of the groundwater, and the proponent has not conducted the proper identification of the water wells in the area, or done a proper assessment of the impact of seismic vibration on the soil and aquifer. The only mitigation that would ensure no harm to people or the environment would be to not locate turbines in vulnerable areas such as this, McGee said. In his cross-examination, lawyer Terry suggested that Magee’s interest was simply that she owns property in the Nation Rise project area, and her real concern was the value of her property. “My concerns are primarily based on geology,” she answered, “and yes, if the wind turbines affect the wells then I am concerned that homes will not be sellable.” Mr. Terry also tried to suggest that Ms Magee used Wikipedia as a source of information to which she responded that she used scientific studies and papers to prepare her evidence, the same papers that may have been used in the Wikipedia entry. She said, she may have used the Wikipedia entry I order to use language non-scientists could understand, she said. The hearing continues October 16, and closing arguments will be presented in Toronto on November 23rd. The proponent has not fulfilled a requirement to identify all wells in the project area. 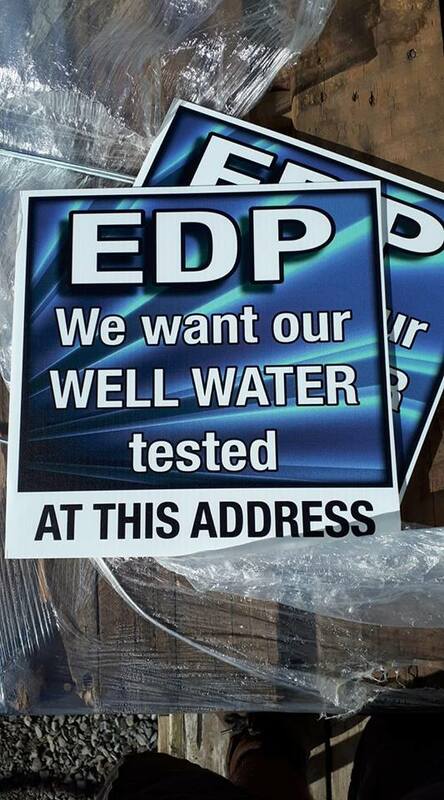 Signs demanding water testing line a street in Finch, Ontario. Ottawa, May 29, 2018 – A community group has filed a formal appeal of the Renewable Energy Approval given by the Ministry of the Environment and Climate Change (MOECC) for the “Nation Rise” wind power project. Water wells in the Chatham-Kent area have been contaminated with black sediment following turbine construction last year, and there are calls for a public health investigation as a result. “We are very worried about what could happen to our water,” says Benke. Noise is a serious concern too, especially because the MOECC has received thousands of noise complaints in Ontario, but few have been resolved, says Wind Concerns Ontario president Jane Wilson. “The reports we obtained from the MOECC under Freedom of Information show that the Ministry has not responded effectively to reports of excessive turbine noise, and instead relies on hypothetical, computer-generated noise models from the turbine manufacturers. Meanwhile, families can’t sleep at night—some have even abandoned their homes,” says Wilson. “That is not the protection of the environment and health Ontarians expect from their government. “With so many reports of problems, the people in the North Stormont area are right to be concerned,” Wilson adds. A preliminary hearing is scheduled for July 5th, tentatively in Finch, Ontario. The Nation Rise power project will be located about 40 km southeast of Ottawa, and includes the communities surrounding Finch, Berwick and Crysler. It is being developed by Portuguese power developer EDP Renewables. Concerned Citizens of North Stormont is a community group member of the Wind Concerns Ontario coalition.